As we embark on a new journey this coming year, we should take a moment to reflect on this year, counting our blessings one by one and we will be surprised how good God has been to us. Most often, we take things for granted that are really big things if we don’t have them like food on our table, a roof over our head, a coat for the winter, shoes for our feet, good health, and peace of mind. If you have had a difficult year in 2013, I wish you love, joy, peace, and success in the new year. Before the year ends, I wanted to do a review of my outfits since I started blogging. Can you believe it's been 3 months already? Time goes by so quick. In this post, you will see a compilation of some of the styles/patterns I've been rocking intentionally and unintentionally. I didn’t realize how much I loved teals/greens until I started doing the fashion in review. My favorite way of styling this color is by color-blocking it with another bright color such as purple, pink, yellow, etc. In Color Burst, I styled it with purple jeans and red ankle-strap heels. In Leopard Prints, I styled it with a leopard crop-top, yellow blazer and leopard heels. In Pine Green with Hint of Pink, I styled it with a pink sheer blouse, black pants and green heels. If you are not a person that loves to wear bright colors, you can pair this color with dark colors such as black or gray and it will still give them a pop of color without you feeling like the colors are too much. Which one is your favorite look? One thing I love most about prints is that they can be worn in any season. Asos is one of my fave stores when it comes to affordable midi-dresses/skirts that are perfect for work or a night out. One of my favorite posts with abstract prints is Zebra Stripes. This would have to be one of my most liked posts. The simple rule I try to keep in mind when styling bold prints is to keep it simple. Often, I pair them up with plain colored heels so it does not distract the designs. See Bodycon Twist, Black Diamonds and Midis and Crop-Tops. 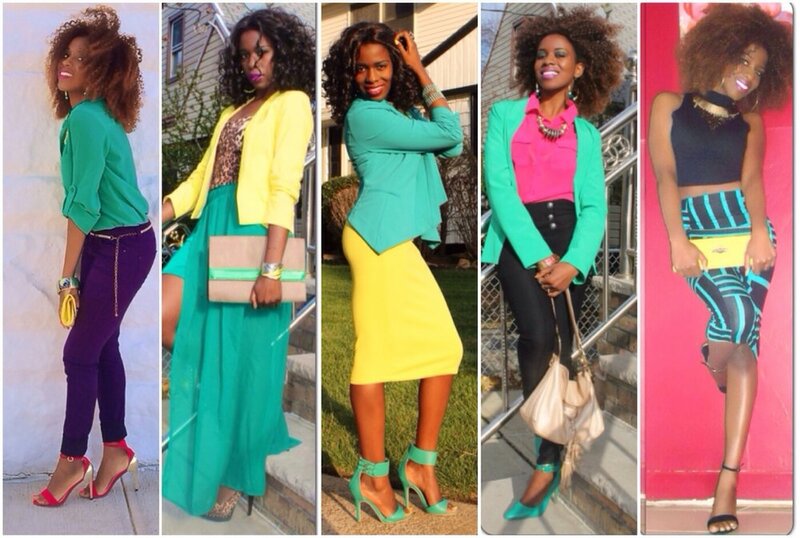 Color-blocking is by far, one of my favorite styles of dressing. A long time ago, it used to be that you had to match everything you were wearing; thank you to the person that invented color-blocking because now you don’t have to match your shoes with your clothes. I understand that this style is not for everyone, especially when it comes to extreme color-blocking. My most extreme color blocks would have to be Color Burst, High Slits in Color Blocks, Edgy Chic, and London in New York. Which one is your favorite look? Stripes are another one of those styles that can be worn year round. They have been a big hit this entire year and they look great with a blazer, floral prints, etc. Since I started bloggin, I’ve done three looks featuring stripes and they've been styled with a skirt, sweater and top. See Stripes in Autumn, Layered Glitter and Uniform Charm. Which one is your favorite look? In my review of dresses, I’ve tried to showcase a combination of different style dresses for different occasions. I wore the maxi sheer purple dress at a wedding; I love the flowing sheer covering of the dress as it adds some elegance to the look. The midi chatreause dress with an open back was worn at an awards show back in October. You can put a blazer over it as shown in the post if you don’t want your back exposed. The mini peplum black dress with a cut out back is perfect for a night out with friends and so is the black and cream bodycon midi dress. I’ve worn these two dresses to parties before. Lastly but not least, the abstract stripes midi dress with an open back can be worn to any special occasion. I wore it once to the Adolf Sanchez fashion show during New York Fashion Week and everybody loved it. See Sheer Purple, Neon Yellow in the Park. I just realized that I have too many skirts, I could not possibly include all of them in this review. The skirts so far have ranged from abstract prints, midis, high slits, and short with maxi sheer covering. Midis are usually my favorite because they are appropriate for work, church, and any other occasion depending on what you pair them with. For an evening out, they can be paired with a crop-top. For work, they can be paired with blouse and blazer. See Edgy Chic. Voila! Which one is your favorite look? A special thank you to everyone that has taken the time to stop by and read my posts. I appreciate each and everyone of you! Until next time, stay blessed and Happy New Year!